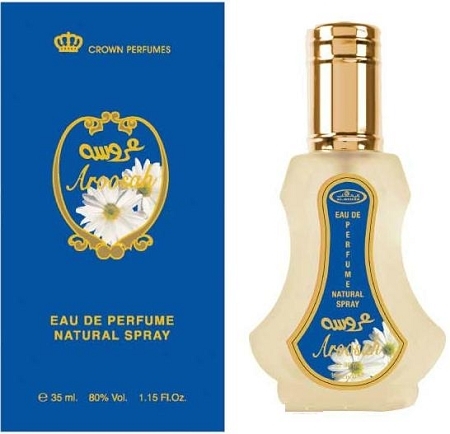 Quite different from the roll-on, which mostly seems to be a potent blast of natural almond with accents of chamomile & sweet soft flowers, the spray version of Aroosah is rich nuanced and more refined. My nose detects the same natural almond foundation as the roll-on, but in the spray, it is toned-down and more discernible as being a note of almond (it is not easy to pinpoint this note in the roll-on). Along with almond are herbal-fruity chamomile, mint, soft florals, caramel/vanilla, wood, and musk. The fragrance is at once green, aromatic/herbal, floral, vanillic, softly powdery, woody and musky. It is amongst my favorite of the Al-Rehab sprays that I have tried so far. Great sillage and good longevity. Excellent product and delivered on time. Thanks.